To go with the beta of TapPublisher 2, we will explain the operation of various modules, until the release of the final version in September. Today, let's talk about the RSS feed! As you may have noticed, a dedicated module as RSS has appeared in the new version of TapPublisher. Previously grouped with others under the "News" module, it is now independent. Simply put, the RSS (Really Simple Syndication) is a data description format for son disseminate information. This flow allows you to stream, via compatible software, the entire contents of a blog, automatically and without the user having to go on your site. 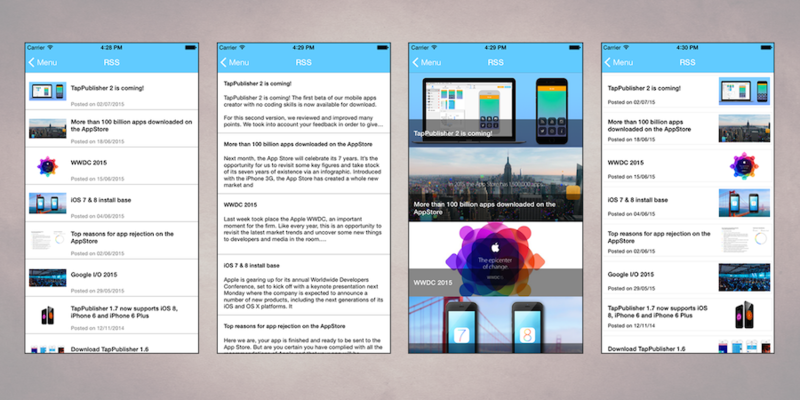 If you have the RSS feed of your site, you just have to put it in the TapPublisher RSS module to configure it. You can also choose the format of display from four different and include a header that will display your latest articles. To find the address of your RSS feed, it's pretty simple. Just go on your site. This one has perhaps an icon leading directly to the RSS feed. If this is the case, grab the URL of this icon by clicking it. If you use Google Chrome, right click and select "Carry out inspection of the element." Press Apple + F in the Inspector which just opened, type "rss" and you will find a link for your RSS feed. If you use Safari, you must enable the "development" option. To do this, go to the "Advanced" tab in Safari’s Preferences. Check the last box "Show Develop menu." You can now display the Web Inspector, which is in the "development" menu of Safari. Press Apple + F in the Inspector which juts opened, type "rss" and you will find a link for your RSS feed. If your site does not have a RSS feed or you do not know how to access it, check with your blog platform to find the address of that stream. Once you have the RSS feed of your site, you just have to write it in the TapPublisher RSS module to configure it. You can also choose the format of display from four different types, and include a header that will display your latest articles.